The circuit which i settled on is a combination of schematics introduced in the LT1033 data sheet. In the standard configuration, shown to the right (Fig. 1), R1 and R2 form a voltage divider which sets the output voltage. 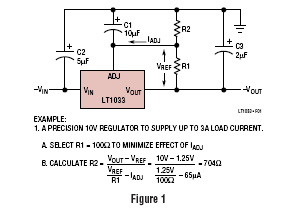 The same output voltage can be achieved with different value resistors as long as the ratio of R1 to R2 remains the same.However, lower absolute values of R1 and R2 increase the load and minimize the impact of the adjust pin current. 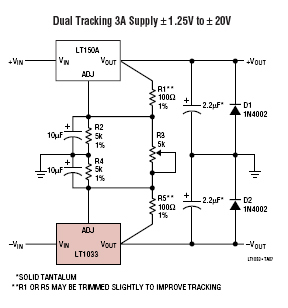 Using R1 and R2 to place a minimum load on the regulator can improve Zout. 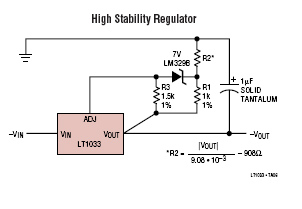 The voltage stability of the regulator can be improved with the addition of a precision voltage reference. The data sheet recommends the LM329b which is a 6.9 V zener voltage reference. One cause of the improved stability is due to thermal isolation -Voltage regulators get hot when loaded. The last component of the circuit i wished to implement tracking. Once again the LT1033 data sheet shows a sample schematic. In this schematic a single resistor sets the voltage on the positive and negative rail, allowing for easy implementation of a adjustable power supply. Furthermore, tracking supplies also maintain the voltage differential between rails. For example, if the voltage drops from 15 to 14.9 on the positive rail there will be a corresponding shift from -15 to -15.1 on the negative rail.The last component of the circuit i wished to implement tracking. Below is the final schematic that combines the elements described above. You may note the diode and the resistor placed between the output and input. The diode protects the voltage regulator when the input voltage is lower than the output voltage. The resistor reduces the transmission of input high frequency noise to the output . Please see this post on DIY Audio for further discussion.